Summer is finally here and many of us are headed out into the sun. Whether you’re participating in outdoor sports or simply taking a walk in the neighborhood, it’s important to protect your skin from the harmful effects of the sun. Do you depend on the regular use of sunscreens for this protection? That’s great! But sunscreens are only one tool that you need to avoid sunburns, a major risk for melanoma, the deadliest form of skin cancer. Proper use of sunscreens is essential, so be sure to reapply as indicated. It’s also important to wear protective clothing, including hats, sunglasses and even long-sleeved shirts, as part of your sun protection routine. There are some new advances in clothing that actually improve the ability of the fabric to act as a filter. The prevalence of higher SPF products seem to lull people into thinking they can stay out too long in the sun. Not so. Testing has shown that they may not actually be higher! And they inherently have a greater concentration of powerful chemicals which may not be safe. Also, SPF ratings refer only to its ability to filter UVB rays and does not guarantee its ability to block UVA’s. SPF’s greater than 50 are marginally better, so stick with those rated 15-50 and reapply often! 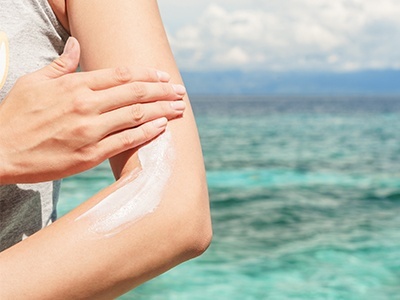 Some sunscreens contain ingredients that can disrupt hormones and cause skin allergies. When you consider that you're spreading large amounts of these products over your body, it’s important to evaluate the active ingredients. One particular ingredient to avoid is oxybenzone. In fact, when I was shopping for sunscreens, I noted that several brands stated that oxybenzone was specifically excluded. The product you choose should say that it provides broad-spectrum protection. That means that it filters out harmful UVB and UVA rays. Choose cream products that contain zinc oxide or titanium, physical barriers that sit on the surface of the skin, avobenzone, or Mexoryl SX. Avoid chemical barriers, added Vitamin A or insect repellents, as much as possible. Avoid those products that you spray because it’s too easy to miss spots or inhale the ingredients. The Environmental Working Group (www.ewg.org) has a “Hall of Shame” of sunscreen manufacturers that include Banana Boat, Coppertone and CVS for using ingredients that are harmful to the lungs and internal organs. Yikes! The EWG rates the safety and efficacy of sunscreens and other products with SPF. Visit their website and you can get specific recommendations and ratings on the products you choose. livestrong.com also has helpful information about your health concerns. I recommend that you take the time to seriously evaluate the suncare products you choose and find those that pose the fewest health concerns. Enjoy your time in the sun!